"I began to give up the use of classical syntax, the logic of cause and effect, of an assumed relation between subject and object, after my sister died. The narrative as story had been ruptured once and for all; I wanted the gaps to show." Revered by John Ashbery for writing poetry that "goes straight to the elastic, infinite core of time," Ann Lauterbach was born in New York City in 1942. Her father worked for Life and Time during the Second World War and died in 1950. This early loss would later influence her verse. Lauterbach studied painting and developed a particular fondness for abstract expressionism. After receiving her B.A. in English (1964) from the University of Wisconsin, Madison, she attended Columbia University for a year. She subsequently moved to London and lived there until 1974, editing books, teaching literature, and directing the literature program at the Institute of Contemporary Arts (1969-1971). On her return to the U.S., she worked for a number of years in her hometown, both as an art writer and consultant and as a gallerist. She also began teaching and taught at Brooklyn College, Columbia, the University of Iowa, Princeton University, the City College of New York, and the CUNY Graduate Center. She is currently a professor at Bard College. Lauterbach is the author of several poetry collections, including Or to Begin Again (2009), Hum (2005), If in Time: Selected Poems 1975-2000 (2001), On a Stair (1997), And for Example (1994), Clamor (1991), Before Recollection (1987), and Many Times, but Then (1979). 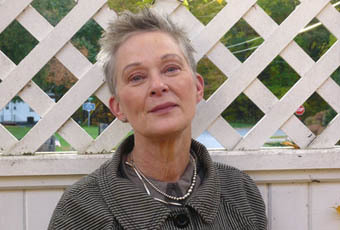 Among her distinctions are fellowships from the Guggenheim Foundation (1986), the Ingram Merrill Foundation, the MacArthur Foundation (1993), and the New York State Foundation for the Arts. TP: You have said that in poetry, subject matter is different from content, and that making sense is different from meaning. Could you elaborate on these distinctions [...]? AL: Subject matter is what you're writing about, the aboutness in the poem, so it's a poem about X: "my trip to Alaska." The content of the poem is going to be what you have to say about that "aboutness," so it's more connected to the work, the formal ingredients, of the poem. The meaning is something that can only come from the reader. You can't invest a poem with meaning; only a reader can invest a poem with meaning. Making sense is only one possible way of making meaning, and poetry has other ways of making meaning. […] I'm much more interested in a more difficult kind of sense-making, and I mean difficult in the sense of complexity, and obscurity, but not willful obscurity, just the fact that there are certain things we cannot penetrate and do not know, we can't know, we may never know. There are things that are furtive and peripheral and ephemeral - I like the idea of being responsive to some of that kind of content. Or, given what I just said, I like trying to make the content address that, those things. So the subject matter in my work is often under the poem, or to the side of the poem. The following piece is from Hum. Written in remembrance of the Twin Towers tragedy, it is probably more potent than the totality of the live, almost surreal CNN broadcasts that we all committed to memory on September 11, 2001. (Incidentally, that started as an uncommonly warm and bright day, a "beautiful" day in New York City.) Using a more or less primordial language restricted to tiny sentences, Lauterbach succeeds brilliantly in what French philosopher Alain Badiou dubbed "thinking the event." that smells of the night. where the sun came up.